You’ve put a lot of time, effort and expense into putting together your website. But is anyone visiting your site or finding it from an internet search? If not, it’s been an expensive and time consuming exercise with no return on your investment. There are many, many great websites out there that look fantastic and are full of useful information and great products. Thousands more are added every day, so there is a lot of competition to being seen in search results and to attain the exclusive #1 position in Google Rankings. No doubt you are already being bombarded by SEO companies (Search Engine Optimisation) from around the world, claiming they are “the world’s best SEO company” and can guarantee you a “#1 Google listing” (if you live in Perth you may have also noticed some very large billboards and expensive cars advertising the same message). SEO companies usually want to charge you a lot of money initially with large ongoing monthly fees to maintain your ranking and with no guarantee of sucess. An alternative to SEO is PPC Advertising. PPC adverting sounds expensive, but it need not be if implemented correctly. 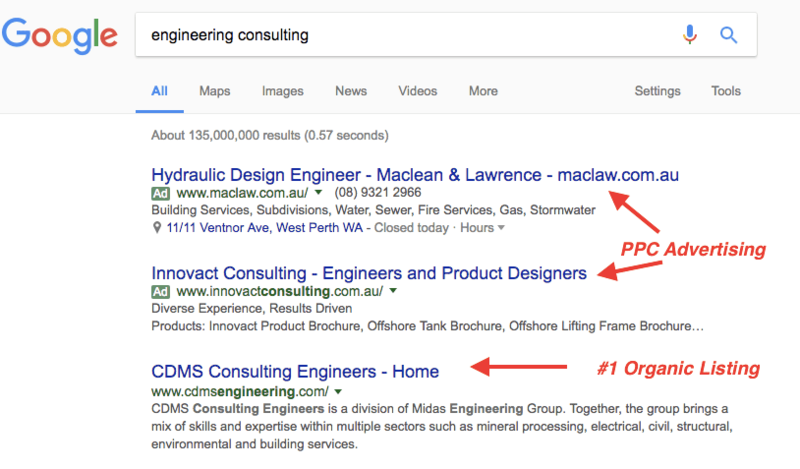 The IT Guys have been utilising PPC Advertising in the form of Google Adwords and Bing Adwords, ourselves and on behalf of our clients for many years and getting highly qualified and filtered traffic to their websites for as little as 15c per lead (click)… hence the term PPC (pay-per-click). You can spend weeks or months and thousands of dollars getting your web page to #1 organically using SEO, only to find there are already one to three paid advertisements (PPC Advertising) above your very expensive Organic listing. What you have effectively paid for is a #2 to #4 listing. And it does not end there. Keeping your #1 organic ranking is an ongoing, expensive and time consuming exercise. SEO companies will tell you that Google and Bing users don’t look at advertisement but they are very wrong. We’ve been using PPC ourselves very successfully over the years and Google and Bing are making millions of dollars per day out of the service, they don’t make any money for organic listings. Organic listings make money for the SEO companies mainly. For only a few hundred dollars we will set you up with the necessary tools to get you going and have your advertisements listed. We will also teach you how to maintain and monitor the PPC service on an ongoing basis. We don’t charge ongoing monthly fees and you can always get free advise and help from your assigned Google account manager. However, if you wish us to provide ongoing assstance, help and monitoring of your account, we are happy to quote you for that also. Lead in Time to implement SEO Services v PPC Advertising Google and Bing refresh there listing once a month, so an initial listing would only happen between 1 and 30 days. SEO Techniques rely on linking to other sites and may not become apparent for 1 to 2 months As soon as Adwords accounts have been setup, PPC advertising can commence. This can be as quickly as 1 day. Ongoing Time/Costs Algorithms used to rank websites are constantly evolving and changing. A #1 listing last week, may slip to #20 within days. This requires constant changes and updating links etc which the SEO company will have to carry out meaning you have ongoing costs that may or may not improve your listing. As above, changes can be made instantly at any time, by your PPC Consultant or yourself. Your ranking can also be changed by either increasing or decreasing your keyword bids or budget. This can be carried out yourself or by a PPC Consultant. Can I switch listing on/off when not needed? Once listed, the site is very difficult to remove from the listing. If you are very busy and you’d rather not receive more enquiries (maybe your going on holiday for some time) you cannot simply pause or turn off an organic listing. You have full and instant control over your PPC advertising account. In can be paused or switched off within minutes. It can be configured to only display on certain days during certain time periods and to very specific geographical locations. Can I quickly list a new website? Google/Bing do not like new websites – Trying to get a website listed that is under 12 months old is almost impossible using SEO techniques Once the Adwords account has been approved and the Credit Card verified, advertising can usually commence within 24 hrs. Day 1 – 3 1 – 2 hrs Examine existing site title and header, create keyword report, agree with client on target keywords, phrases, audience, budget. Implement Adwords, Analytics, Webmaster Tools and establish baseline to measure against. Day 4 – 7 15 mins Agree with client, switch PPC advertising on. Day 14/21 1 hr Run keyword and Adwords report, report to client and implement any further changes. Day 28 1 hr Hand Over to client, discuss any new changes, teach client how to make changes to keywords, adverts and to run reports and analyse results. What is Google Adwords? – “Google Adwords” is the program for implementing paid advertisement in the form of listing in Google Search results. They appear on top of and below the existing “organic” results. Google Adwords is paid for on a PPC basis (see below). Google is the default search engine for Internet Browsers used by Apple (Safari), Mozilla Firefox, Google Chrome. It can also be chosen as the default search engine for Microsoft’s Internet Explorer and Microsoft Edge. Google accounts for approx. 64% of all internet searches. What is Bing Adwords? – Bing is the Microsoft version of Google Adwords. It is the default search Engine for Internet Explorer and Microsoft Edge and it’s market share of internet searches is over 25% and rising monthly but it is not so easy to use or get your ads approved. Why would you use both Google and Bing? – Google used to be the undisputed king of internet searches but with the implementation and roll out of Windows 10, new computers are defaulting to using Bing with many users not being able to switch back to using Goggle (because they cant work out how to). So to cover 95% of the internet search market you need to implement PPC advertising on Google and Bing. Can I implement Adwords myself? – Yes, you can implement these features yourself but without some guidance you may pay a lot of money and possible get little traffic from the wrong people in the wrong places at the wrong time. This is where our 17 years of website promotion experience comes into play. You can also get FREE advise from a dedicated Google Account Manager who will advise you on various new techniques that Google introduce from time to time. What is PPC? – PPC stands for “Price-Per-Click”. Google and Bing will list your advertisement in their search results for FREE, but will charge you when someone clicks on one if your advertisements and ends up being redirected to your preferred web page. Depending on the popularity of the word or phrase you are targeting, you may have to pay anywhere from a few cents to many dollars for each click, to get the traffic to your site.